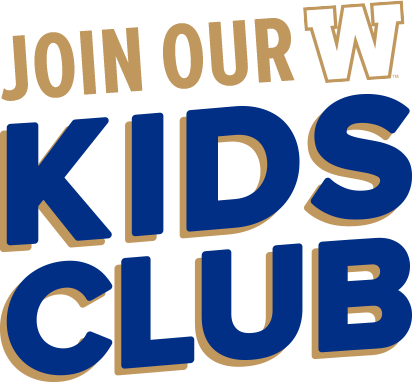 The Blue Bombers Kids Club is an exciting opportunity for young fans to engage in an amazing football experience! Get access to exclusive events, promotions, contests and player meet & greets. Anyone under the age of 15 qualifies for this deal! Better yet, Memberships are FREE! Let your favourite kid know and tell some others while you’re at it. You will receive a promo code for one free youth ticket per registration (limit one child per registration). Valid for Blue Bomber regular season home game (*Excluding the Banjo Bowl presented by Casinos of Winnipeg). Returning members will receive a promo code by email prior to the start of the season. Find your Waiver for activities at Investors Group Field here. How many tickets does my Kids Club membership include? Your Kids Club Membership will include one ticket for this season. How do I get my ticket for this season? Your promo code for the free youth ticket will be sent by e-mail before the season. I signed up for the Kids Club in a previous season, will I receive a ticket for this season? Yes. Both new and returning members will receive a ticket promo code by email. How do I buy more tickets that are sitting in the same section? One of our ticket services agents will be happy to help you, please call 204-784-7448. How many kids can I put under one membership? Your membership is good for up to four children per registration. What kind of e-mail communication will I receive from you? You will receive e-mails about special promotions, invitations or offers for Kids Club Members. Who can I contact with concerns or inquiries?